We faithful attendees already know that this is the premiere event to actually light that fire under one’s arse. After four luxe days at the Mark Hopkins, you will return home desperate to write in your own blood if all of your quill ink has run dry. The energy is infectious. If you are a writer, or know a writer, pass this along. This is one of the BEST conferences in the country. A couple of years ago, R.L. Stine was our keynote, giving everyone in the room…..yes, goosebumps! The water’s warm. If you’ve got a book burning in you, (even better, a series!) then you have nothing to lose by jumping in. Either you’re a writer, or you’re not. This will help you find the answers. If you missed my 2-minutes at the mic when I shared everything I have taken away from SFWC after attending nearly every year since 2007, then here is a little recap of gems that have been very helpful to me. 1. Make Your First Impression Count. In 2007, I arrived with my first independently published book in hand. Heroes Don’t Always Wear Capes is the coming-of-age story that follows the underdog student from pre-school through twelfth grade on her search for an inspiring teacher. For the educators you know, there is no better gift of appreciation. After I attended Linda Lee’s session on platform building and learned how essential it is for authors to have a website, I had her construct mine. 2. Ask for what you need from table mates—and be genuine in your offer to help them, too. Every time someone was generous enough to ask what they could do for me, I had an answer ready. When I met a teacher from a neighboring district—coincidentally enough—she asked how she might help. I wondered if she would introduce my Heroes book to her principal—she did one better, putting it in the hands of her Superintendent who bought a copy for every hero teacher in his district. A few years later, I had a second book 9 Realities of Caring for an Elderly Parent: A Love Story of a Different Kind. Powerful reading if you are the adult child returning home to care for a parent when they can no longer care for themselves. Lots of tips, and solid reviews. What I needed was an endorsement from a medical professional. Lo and behold, it was my seat mate who agreed (evidently he has written endorsements before as a highly regarded doctor familiar with dementia). Every author needs to build platform. Social media likes can really be ramped up at a conference. Ask people to follow you on Facebook, twitter, Goodreads, Instagram, and where ever else you need to increase your presence. Be kind, follow them as well. I recommend avoiding small talk, and instead, open your conversations with, “What do you still need, how can I help?” The frenetic pace of the conference means you might not run into that same person again. Grab your chance now. 3. One Contact Begets Many. Here is proof that a single connection can snowball into many, many opportunities for your future writing career. Linda Lee generously connected me with Robin Fahr, a cable TV talk-show host who interviewed me about 9 Realities and now I had footage on my site. But, Robin Fahr was not just a talk-show host—she had built a reputation as a PR gal for decades and had contacts with all of the powerhouse media outlets in SF. She scored hour-long interview formats for me on both KQED/Michael Krasny and KGO/Ronn Owens, plus KTVU/Bay Area People. She also got me a national radio tour in select regions and it was the best experience I could have had. I would imagine this nice lady would be willing to point you in the right direction if you sought her out in my Press Room. From this one interview, my public speaking opportunities increased to include a keynote invitation for a regional education conference, which ultimately lead to the Bill and Melinda Gates Ed Foundation national keynote I gave to 500 teacher leaders. An amazing opportunity which I have blogged about before: https://stefaniashaffer.com/why-do-teachers-love-bill-and-melinda-gates/ I am now considered a resource on both Education and Elder Care topics. 4. Those nuggets from keynote speakers are golden. Guy Kawasaki was the keynote. It didn’t matter that I was not familiar with him because I soon became a big fan! He wrote a bestseller on how to market your self-published book to millions. He was funny and insightful, but he mentioned he had also used Penny. I didn’t know Penny then, but years later this nugget would connect me with her. When I returned last year to SFWC, I actually sat in on a presentation done by the Penny. It was sizzling! Red-hot marketing tips I could try on my own….or with her expertise. What I needed was to breathe new life into 9 Realities. I had done all that I could on my own. Her first suggestion when we met—take all of the How-to’s and To-do’s and create a workbook version as a companion to the Memoir. Ta-da! My third book was born and so was a comprehensive and extended marketing campaign with Penny, the super-seller and marketing guru extraordinaire. And from Penny, I was introduced to the life-saver I am still using, my VA who helps tackle a lot behind the scenes so I am freed up to WRITE. In the meantime, if you are feeling generous and you are a writer wondering what I might still need from you? Glad you asked:-) Would you please consider following me on Goodreads? Stefania Shaffer is currently at work on a 4-book MG series about little mischief-makers in elementary school and how they grow forward. Beta-readers for the first two books are eagerly anticipating the release of all four books in late 2017. This entry was posted in Media by 22200657. Are You Working Harder or Working Smarter? As a new teacher, your ambition is going to be the death of you. Yes, you were hired for IT and admired by your principal because of IT, but you will soon find out what every veteran teacher has already come to discover—you cannot get out of the way of the work. Like Sisyphus, whose mythological plight was to roll a boulder up hill for all of his hours until it would come crashing down upon him at the start of each new day, teaching almost teases you into thinking that if you stay for two extra hours tonight, maybe you’ll finish the pile of grading still to be done, or lessons still to be planned. Everything you will communicate to parents will be about how their child is performing in your class. Everything you need to communicate to your administrator will be about how effective you are at helping children develop. Every bit of knowledge you exchange with colleagues about trials and victories will again relate to how well students are doing in one class and how a teacher might change practices to have the same kind of success. When you are a busy educator, you need some time-saving tricks for getting to the heart of the matter more quickly. Anticipating your needs is something that just comes with time on the job. But since I recently spoke to a nice group of NDNU teachers-in-training, I thought I’d share some of the tricks I’ve learned along the way that I shared with them. Here are the handouts. This will be helpful when you are sending out the plethora of packets each District requires. Yes, a lot of this can now be done electronically, but having a file copy and keeping notes is still important. Ideally, you have created your own checklist so that there are no blanks to fill in over and over again. You probably know which top three letters of recommendation you would like to use, list those names so you don’t need to re-write them on each checklist. True also for the colleges and coursework completed for any campus that holds a transcript for you. I learned a few years into my career that I had become that teacher who would hand out a single piece of paper 3 or 4 times during class. Each time, this distribution resulted in the same shoving into the backpack and stirred up the energy in the room, taking precious minutes away from focus. When I finally realized my error, I helped the students get organized by spending my two hours at the copy machine to make learning packets for the month. Yep, two hours—but only once a month. It worked for me. It also worked for my students. The kid-friendly version covered due dates for readings, workbook pages, and the kinds of writing we’d be doing—complete with upcoming test date, and even more importantly, the date this packet was distributed in class. No one ever lost it. No one ever complained. It was a much more efficient system and kids like to know what’s happening. The biggest selling point—parents LOVED it because they knew the plan for the month. I cannot emphasize enough how vital it is to communicate with parents. Partner with them. A supportive parent can do a lot for your reputation! A long time ago, I learned that I was spending a lot of my grading time writing the same comments over and over again on seventh grade essays. I never tested writing skills until I was confident my students had mastered the basics we had practiced in class. So when I was ready to call for an essay, they would write in class to a surprise topic and show me what they could do. What they really wanted was immediate feedback—and the A. In order to provide both, I trained them on the rubric elements I would be looking for. I shared examples of writing for them to compare and discuss how they would grade each sample I had created for them so that they could learn the differences between being a Proficient and an Advanced writer. Once they knew it—meaning they could even give each other tips on how to improve—they could churn out impressive essays for me nearly every single time. This made my grading much faster because the reading was easier, PLUS the rubric allowed me to merely circle the scores and comments. When students understand how they will be held accountable, they will consistently rise to the occasion. Happy teaching in your new District! This entry was posted in Education by 22200657. It is always a great thrill to speak in front of an audience of teachers. They are my people, my tribe! I still remember what it felt like to be new in this profession at the beginning of this century so I am happy to share a message of the realities facing new teachers coming into today’s classroom. Here is my speech from the California Teachers Summit Better Together held simultaneously across 38 California State college campuses. It was an incredible event. Thank you to the team at San Francisco State University for making me feel so welcome. If we want to have 21st century students, we must have 21st century teachers. A long time ago, at the turn of the century (into the 1900s), there was a whole different set of rules that were expected of teachers. Don’t dye your hair. Don’t loiter downtown at the ice cream parlor. Do make sure your classrooms are warmed before the children arrive. Do be sure to clean your floors weekly and your blackboards daily. You get the idea. Would it not be nice to have a handbook of new rules for the 21st century teacher? But alas, the captains of industry all around us already know what they consider to be “good hires.” So as we prepare our students for college and career readiness, we take a cue from what business leaders have communicated they need from employees in today’s work force. And if you add in digital and financial literacy you’ve just created the well-rounded human ready for today’s work place. It seems so obvious to us. However, when our students hear the term Google, all they really know is how to find the work that someone else has already created. It only takes them 30-seconds and they truly believe they have just achieved the task we asked of them. We need to teach them that the 21st century student is able to add in a new layer of insight beyond the research already available. We are asking them to use their own brain to create a solution that has not yet been tried. For the entire speech and solutions to try in your own classroom, click on Stefania Shaffer-SFSU Keynote: Are You a 21st century Teacher? This piece of fan mail comes in the form of a blog review by Carol Cassara for both the Memoir 9 Realities of Caring for an Elderly Parent: A Love Story of a Different Kind, and The Companion Playbook, just released June 2016. Are you concerned about what will happen when your elderly parents can no longer care for themselves? No one gives us caregiving advice when we’re younger. As we get older, so do they, and often, it falls to us to figure out what to do, how to handle it. No one has prepared us. 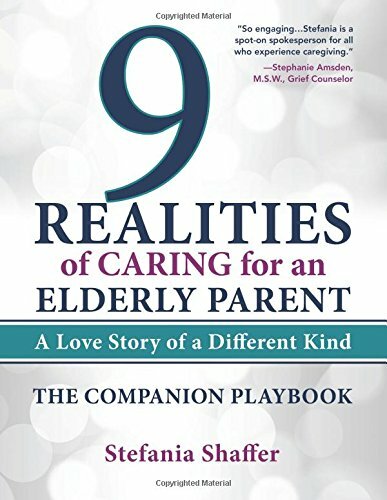 9 Realities of Caring for an Elderly Parent is subtitled “a love story of a different kind” and it’s clear that author Stefania Shaffer speaks for many experienced, compassionate caregivers in her new book. Practical advice, compassion, action plans—it’s all here. The humorous incidents, the frustrating moments and some of the most touching, moving prose that I’ve ever read. She tells her own story, and all along the way provides excellent advice and compassionate understanding that anyone engaged in caregiving—or planning for it—would find helpful. Plus, she’s done a tremendous amount of research so her readers don’t have to — it’s chock full of useful resources. Given in the context of her own caregiving story, the advice is starkly appropriate. If, for some reason, a reader wants a shorter version that includes only advice and resources and not her beautiful story, the shorter Companion Playbook has “just the facts, ma’m” and is available separately. But why would you not want her memoir? Shaffer’s story is moving and beautiful and so worth the read. This would be a thoughtful gift –for a holiday or just anytime– for someone who is either anticipating caregiving or in the midst of it. I am no stranger to caregiving. When my mother was hospitalized for almost a year, I spent at least a week or two a month traveling from Florida to western New York so I could be at her bedside, helping care for her. My siblings both worked full-time, so my visits, thanks to leave from my own work, were the few long stretches where a family member had long days of caregiving duties over a week or two. Which is an entirely different thing than popping in for a couple of hours. I was, in a word,clueless. During the last year of my beloved friend’s life, her closest friends banded became a caregiving team, even spending the night with her for periods of time. It would have been so helpful for us and her grown children to have this book. I was glad when Stefania offered to send me a copy for an honest review and even happier to highly recommend it. You want this book and I want you to have it. In fact, I want you to have both the book and the Playbook and so does the author. We’re doing a giveaway of the duo of books to one lucky person who comments on this post. Comment below, making certain your email is in the comment signup so I have a way to reach you if you win. This giveaway is open to residents of the continental U.S. and the deadline for entries is Monday, Oct. 24, 2016 at 11:59 pm. Yep, just before it’s Tuesday. And if you don’t win a book? Buy it. The caregiving advice is superb and the memoir is beautiful. You won’t be sorry. It’s available at all the usual places. This entry was posted in Education and tagged Boomers, caregiving by 22200657. This fan mail comes from Lucretia’s Blog after reading 9 Realities of Caring for an Elderly Parent: A Love Story of a Different Kind and The Companion Playbook, released in June 2016. Way back in January 2014, the day after my mom went to the hospital for emergency heart surgery, I attended a talk given by a woman who had gone through pretty much what I was about to go through, and who had written a book about her experience. The book is “9 Realities of Caring for an Elderly Parent”, and the author, Stefania Shaffer, was touring to promote it, and was invited to speak at our university. I almost didn’t go, because I was afraid the hospital might call while I was at the talk; it turned out to be one of the best things I could have done. Not only was I inspired by what she had to say at a time when I really needed it, but I bought her book and read it while dealing with caring for my mother and grandmother. During those two years when I was shuttling back and forth between home and my mom’s house (or the nursing center), I sometimes felt VERY much alone. Although my friends and family were verbally supportive, I had very little help with anything that actually needed doing, not because nobody wanted to help, but because most of the time no one else was in a position to. Unfortunately, this happens to many people who find themselves suddenly having to care for elderly parents alone, when other family members are either unable or unwilling to pitch in. “9 Realities” became part of my support group, because I was able to compare what she had to deal with against my own situation. I sent copies to a few friends to help them cope as well. When my mom died, I read the section on grieving more than once, to remind myself that I still wasn’t alone. “The Companion Playbook” came out just this year, and I was privileged to receive one as a gift from Stefania. I sure wish I’d had it while my mother and grandmother were alive, I could really have used it as well! It not only has the really important points from the book reiterated in “nutshell” format, but it has charts and checklists for each point that can be used as written or adapted to your individual situation. The Playbook can serve as a stand-alone guide without the original book, if you really don’t have the time to read that as well. This entry was posted in 9 Realities of Caring for an Elderly Parent-Memoir, Elder Care and tagged Boomers, caregiving by 22200657. Sorting the RX bottles in alphabetical order will make your inventorying much easier when it comes time for renewals later. There are many compelling reasons that surround my move back home to live with my elderly mother—none the least of which is the near accidental overdose from the many Rx prescriptions whose labels she can no longer read. 1. Does your eyesight still allow you to easily read the Rx labels so you know the proper dosage to take? 2. Can you hear well enough over the telephone to place renewals for your Rx? Keep in mind automated phone robots—not the pharmacist—usually take and confirm your orders. 3. Do you have an organized system for dispensing meds so there is no confusion over did I already take my pill, or did I forget to put it on the tray? 4. Do you have a way to keep track of when renewals are due? Or are you surprised when you find an empty bottle and no pills left for today’s dosage? I am sick at the prospect of taking on this role by myself. But after the brother living nearby trains me, soon enough, it becomes part of my new weekly routine. After studying his approach to counting, sorting, chopping and calling for the renewal of these pills, I feel confident that I can reorganize the grocery sack housing my mother’s entire health regiment. Step 1- Familiarize yourself with the pills. 1. Know your pills by name and the reasons why each is taken. 2. Know when and how the pill should be dispensed … with water, food, or on an empty stomach? 3. This should be obvious, but be sure your doctor knows all of the medication you are taking in case one pill has a reaction with another. It’s especially important to communicate if you have more than one doctor—or are meeting for the first time a physician who is new to you. 4. Prepare a pill chart and laminate it. Keep it in your wallet. This will be essential information to provide at every doctor visit. 5. Recognize the grooves and sizes that distinguish all white pills from each other. After the first time you drop your med tray (it happens! ), spilling pills everywhere, you will know just how to put it all back together again. 1. A shoebox holding a dozen prescription bottles upright works for me. 2. Sorting the bottles in alphabetical order will make your inventorying much easier when it comes time for renewals later. 3. On top of the bottle cap, write the renewal date due in Sharpie pen. 4. Keep the blade for chopping pills inside this box as well. 5. The shoebox is for storing the bottles. The med tray is for holding the day’s dosages. Different sized med tray dispensers range from one time a day for 7-days to multiple times of the day for 7 days. The latter is what I use—and here is why I love it. There are four vertical rows, with 7 cells across in each row. The first two rows are yellow. The two rows beneath are blue. Guess what? Since I do not need to dispense meds four times a day, I re-label the slats to give me two weeks worth of pre-planned pills. Now I can load the tray with A.M. and P.M. meds knowing that the yellow is for week 1 and the blue is for week 2. Time saver for sure! 1. Do not put a nearly empty pill bottle away without red-flagging it. Forgetting that tonight’s dinner pill was never renewed can be further complicated when it requires a doctor’s approval which—this being Friday—you will not get until Monday. 2. Post renewal dates on top of standing bottles making it easier to note. Now that you have taken stock of your Rx collection and sorted that mess from your grocery sack storage, you should be well on your way to managing your prescriptions with greater ease and care. With your new system in place, it will be a breeze if and when someone else needs to take over for you. “What to Ask When Hiring a Caregiver?” will be my next blog posting here. Stefania Shaffer, a teacher, speaker, and writer, is grateful her WWII parents raised her to do the right thing. 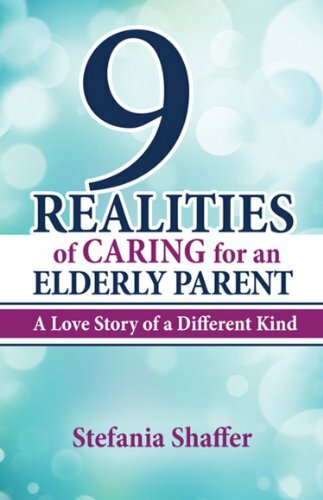 Her second book, the Memoir 9 Realities of Caring for an Elderly Parent: A Love Story of a Different Kind has been called “imperative reading.” Funny and compassionate, this is the insider’s view of what to expect from your daunting role if you are the adult child coming home to care for your elderly parent until the very end. The Companion Playbook is the accompanying workbook that provides the busy caregiver with the urgent “to-do list” to get started today. Check out Stefania Shaffer’s Amazon books and reviews by clicking here. This entry was posted in 9 Realities of Caring for an Elderly Parent-Memoir, Elder Care by 22200657. It is your obligation to understand the paper trail before you begin shredding. I began piecing together fractions of clues to find money that was never listed. It hardly seems fair that as soon as we pay bills, review statements, manage family calendars and school cubbies for the month, all of this ironing out will inevitably become all bunched up again when next month’s paperwork requires the same attention. When it’s our own personal finances, it is easier to put aside organizing—waiting until you have the time. This could be months down the road for busy people because let’s face it, who isn’t overextended these days? But, when we find ourselves in the position to manage the finances and household bills for our elderly parents, this is one job that requires careful attention to detail because you will need to account to siblings, attorneys, and the IRS eventually. Here is the approach I took to getting my mother’s financial house in order and managing the paper trail. First, the visual of the mess I walked into. My father managed the finances for the duration of my parent’s fifty-four year marriage. My mother preferred to manage the home and these roles worked well—until he died. She upended any system he put into place and when I arrived on the scene it was mine to figure out from mountains of paperwork. For the thirteen years after his death, she would open the mail, then re-stuff the statements into shoeboxes that would line bookshelves, bureau drawers, and stay tucked beneath beds when there was no more room on tabletops. Can you see it? The scope of what these thirteen years of statements amounted to ended up taking me a few years to unravel. Perhaps you are wondering what could be so important from that long ago that I would even need to bother taking the time to sleuth through it all. I can tell you the moral of this story in one line—do not throw away any paper until you understand what it means to your parent’s financial picture. It will not matter that you will need to dig through 200 empty checkbook cartons because the first one you opened had $50 cash hidden inside. It will not matter that you have amassed eighty-five bankers boxes filled with decades of statements to sift through at your leisure while you work to make sense of the portfolio and uncover where any assets might be hidden. Do your due diligence. You will sleep better at night knowing that you unearthed every account, every safe deposit box in town, every long term CD you stumble upon just because you are willing to do the job the right way. The wrong way would be to hire a clean sweep crew who will charge you an attractive rate and send strangers in to cart away all the mess you don’t have time to deal with. They are counting on this. It’s how they make their living because they will find cash that is hidden in places you never looked. Believe me, your obligation is to understand the paper trail before you beginning shredding. I toiled summer after summer when school was out to piece together fractions of clues to find money that was never listed on spreadsheets or statements. Glad I did. We were running out of cash near the end and I was at the beginning of looking into a reverse mortgage to stay afloat for however long my mother’s decline would last. It was only then that I found the bulk of her wealth in the form of stock certificates from the 1940s that had never been registered. Imagine if I had just shredded these like everything else. They were in the eighty-fifth box of papers and did not look familiar to me. Thankfully, Charles Schwab knew just what they were. Every statement I uncover from every dark corner of my mother’s house that is not dated within the past 12 months, is filed as long-term—something I can peruse later when I have the time to gain some insight about accounts that are active, or have merged, or have been cancelled in the years since my father’s death. I never recommend bankers boxes for permanent storage, (think, flooding!) but temporarily, they are an affordable way to clear clutter from the house. Label carefully, this will save you oodles of time when you are searching later. Every statement dated within the past 12 months is filed as short-term—these will be immediately transferred to your filing system once it is set up. I make an alarming discovery once I go through archives vs. active accounts—my mother’s home insurance has been forcibly terminated for failure to pay. Somehow it got missed and once this is the case, you are dead in the water. You cannot return to the insurer who carried your policy for 35 years, and you cannot reinstate a home policy without a new roof inspection. It will not matter if your roof does not leak, as ours is still good, but there will likely be some work needed when it comes to old houses. So if you do not have the financial reserves, be careful to never find yourself in this predicament. I still work with paper. Online banking is great for quick pay, but I am more comfortable perusing month-to-month statements when I need information. I need a paper trail. I buy a short filing cabinet and unload the entire contents of the “Active” box—all mail pertaining to the current year—and I sort paperwork into piles in alphabetical order using yellow sticky notes to post the alphabet along the hallway wall, filing each statement accordingly. Assign a hanging folder by labeling a Post-it note with the company’s name found on the statement. Be sure to file most recent month on top, with subsequent months behind it. A binder can also work when you have fewer accounts to manage, following this same alpha and chrono set up. It’s still a paper trail. I follow the sage advice to not throw anything into the garbage that has identifying information: your name, address, social security number, credit card numbers, telephone, birth date, checking account number, any financial statements, even credit card offers you consider to be junk mail. Be prudent. When you are certain you understand what these papers mean to your parent’s wealth, shred or burn your important papers. For the kind of bulk paperwork my mother has, I choose a shredding service which has very affordable rates and will sometimes send a truck to your house. Many times, churches, or local community centers will offer neighborhood shred days. The best part is seeing your heavy load turned into confetti in seconds. When paperwork arrives before I have the time to address it, I like to use a safe drop spot where I know it will still be waiting when I look for it. Mine is a basket with a lid. I reserve a “man drawer” in the kitchen for my husband. My students tell me their busy Moms create a cubby for backpack storage, plus a personal In/Out two-tiered box with a colored folder for each child so permission slips and homework are always in the same place. One thing that could have saved me immeasurable time was to have a list of where safe deposit boxes were held (and keys located) or CDs with their maturity dates. The more we can organize, the more of a gift it will be to those left behind. Once you figure out what your needs are, it is so much simpler to find the system that will work best in managing the paper trail. “How to Streamline Your Rx Collection” will be the next blog posting here. This is my Guest Blog appearing on Rita Morgan’s Blog-Not Just the Kitchen created for Baby-Boomer Women. This entry was posted in 9 Realities of Caring for an Elderly Parent-Memoir, Elder Care and tagged finances, household finances, organizing, paper trail, paperwork by 22200657. This is my Guest Blog appearing on Rita Morgan’s Blog “Not Just the Kitchen” created for Baby-Boomer Women. This entry was posted in 9 Realities of Caring for an Elderly Parent-Memoir, Elder Care and tagged closet by 22200657. Dear Readers, How Do I Say Thank You? There are still only two, teeny, tiny words that we use to convey even the biggest, most monolithic proportions of gratitude—thank you. These simple syllables seem so mild in their meaning because of their overuse. Thank you for taking out the garbage. Thank you for picking up the dog doo. Thank you for not closing that door on me, Sir. However, even for medium-sized appreciation, they are the best that we can do. Oh, thank you! Your wedding gift is much too generous. We are so glad you could stay with little Timmy—thank you, Granny! But there is another expression of gratitude that exudes such heartfelt emotion sometimes no words are needed. When there are tears of joy, the do-gooder knows all there is to know. “Thank you.” Alas, this generous pairing of words has flummoxed plenty of crafty writers who have searched their lexicon for the perfect substitution—to no avail. So, I am left with creating a single note of appreciation with this lasting picture. We meet on the street, you and I.
I’ve just read your wonderful review, the one where you gave “9 Realities of Caring for an Elderly Parent: A Love Story of a Different Kind” a knock-my-socks-off 5 stars! I recognize you by your beautiful, intuitive soul and I rush to give you the heartiest handshake, and a big bear-like hug of a greeting. I am suddenly overwhelmed with silent tears streaming out of my eyes while I simultaneously beam and smile broadly. This entry was posted in 9 Realities of Caring for an Elderly Parent-Memoir, Elder Care and tagged adult child caregiving parents, elder care, thank you by 22200657. Then one day, on your usual stroll of the neighborhood, those garage doors are popped wide open for the whole world to see. You shudder and gasp aloud. You don’t want to linger for too long because it is rude to stare, but you silently wonder how someone could live with floor-to-ceiling clutter that has been amassed for decades. If you are only too familiar with this sight, let me offer you some reassurance that there is a path to purging. When I said yes to the job of caring for my elderly mother, I had no idea I was also saying yes to care for a house that had been equally badly neglected. Driving up to my childhood home where my mother still lived nearly 35 years later, I see the lawn is no longer green, nor mowed. It resembles something out of the savannah that my father would have tackled in earnest at the first sighting of crabgrass—had he not passed away thirteen years earlier. Nothing is recognizable to me. It’s not like we ever lived with white-glove standards growing up, but we were a tidy family if you didn’t count the mud and blood the brothers were always traipsing in. But, on this day my childhood home is operating at the highest level of dysfunction. Of five bedrooms, four are being used as attic space where wardrobes from thirty years earlier are sprawled across the floor, mixed in with old blankets and petrified briquettes of cat doo-doo. All I can think to myself is who is going to oversee the gut job needed on this house? Tearfully, I am afraid I already know this answer. The garage looks worse than what you might imagine. Even more disconcerting is the pile-up of paperwork saved since my father’s death. My old bedroom is filled with envelopes containing statements stuffed into them, then packed into shoeboxes piled onto the bookshelf, or tucked into drawers, or peeking out from beneath beds. Depression-era parents. Need I say more? Thank goodness my mother is willing to put her trust into what she calls my good judgment. “Health, Safety, Style” becomes our mantra for the care that will need to go into her—and her home. Here are the ABCs to beginning any difficult task: Assess, Begin, Carry On. Every frontiersman knew to survey the land. What is the kind of stuff piling up, memorabilia or junk? Who will miss it? I feel a sense of responsibility to the other siblings to preserve their trophies, yearbooks, and kinder artwork—theirs to ditch if they so desire. Before you can salvage anything, you need a good staging area. Step 1- De-clutter the garage first. * Paperwork station—tower plastic crates labeled for archived financial statements. Caution: never throw anything away until you understand what it means to your parent’s financial picture. I found wealth buried in the 85th box. Your job is not yet over. Paperwork sorting becomes my passion. Step 4-Active vs. Archive File statements accordingly. Active is for accounts paid in the past year. Scrutinize each to make sure your elderly parent is not experiencing financial abuse. File current month’s statement at front, older months behind. Archive older statements from previous years. Keep these only for gleaning how money changed hands through investing or bank accounts. Cluster 2-3 years of old statements into one lidded plastic crate the size of a bankers box. Label front as “Archive 2012-2015” Repeat this until all of your bundles are in separate bins. Once you get a handle on the Active, return to the Archives at your leisure to understand financial history. Efficient closet makeovers will be the next blog posting here. Stefania Shaffer, a teacher, speaker, and writer, is grateful her WWII parents raised her to do the right thing. Her second book, the Memoir 9 Realities of Caring for an Elderly Parent: A Love Story of a Different Kind has been called “imperative reading” Funny and compassionate, this is the insider’s view of what to expect from your daunting role if you are the adult child coming home to care for your elderly parent until the very end. This entry was posted in 9 Realities of Caring for an Elderly Parent-Memoir, Elder Care and tagged age in place, caregiving, elder care, hoarders by 22200657.